This time of the year is again the right time to plan a colorful display of flowers for next spring. If your garden failed to impress last spring, you can lay the groundwork for a more satisfying experience in the spring of 2019. The early fall is the time to plant spring-blooming bulbs. A good selection of such bulbs will become available around mid-August to early September in local garden centers and from mail-order nurseries. Two categories of bulbs will be in the greatest demand and likely to be snapped up while some gardeners are just beginning to plan. These two categories are (a) the most popular and (b) the more unusual. For a list of the most popular spring-blooming bulbs, visit the National Gardening Association’s website, garden.org and search for “The Top 50 Most Popular Spring-Blooming Bulbs.“ You will not be surprised to find several varieties of tulips and daffodils at the top of this list. To learn about the more unusual spring bloomers, visit the website for Brent & Becky’s Bulbs, click on “Media” and open the file “Spring Flowering Bulbs Cultural Instructions.” This downloadable free publication includes both a long list of spring bloomers and detailed instructions for growing these plants, with particular information for the cultivation of tulips and daffodils. Another good source of information for both popular and unusual spring bulbs, visit McClure & Zimmerman. My garden includes a good number of daffodils (all the same cultivar) that I enjoy each year, but the more unusual bulbs are most appealing. This year, I am learning about fritillaria, a genus in the lily family, with about 140 species. The most popular is F. imperialis, called “The Crown imperial,” which is native to countries of the eastern Mediterranean region, e.g., Turkey, Iran, and Iraq. The plant grows over three feet tall and is available in several varieties that have blossoms of different colors. It grows best in full sun, in zones 4–7. The Monterey Bay area is in zone 9, so F. imperialis might be a risky choice for growing here. A better choice for this area would be F. meleagris, called the Checkered Lily, “Snake’s Head Fritillary,” or “Guinea-Hen Flower.” This plant, which is native to Europe, will grow in sun or partial shade, in zones 3–8, so our local zone 9 environments might be “good enough” for this plant. It will reach to only fifteen inches tall, so it’s not as striking as F. imperialis. Another important group of spring bloomers that the bulb catalogs do not offer is the irises. That must be because irises grow from rhizomes rather than bulbs, and are offered by specialty growers rather than bulb growers. I call attention to irises because I have a long association with the Monterey Bay Iris Society, which is preparing its annual rhizome sales. The first sale will occur on Saturday, August 4th at the Deer Park Shopping Center in Rio del Mar. The second sale will be on Saturday, August 11th at the Aptos Farmer’s Market, at Cabrillo College, Aptos. These sales are excellent opportunities to acquire iris rhizomes at good prices and to receive good advice from local enthusiastic gardeners. If you already have irises in your garden, they should be dug and divided every three or four years for maximum blooms. I call attention to this task because my own irises are overdue for dividing! Whether you prefer popular or uncommon spring bloomers, preparing for a delightful spring garden happens during the next few weeks. To begin, identify space in your garden where you could plant spring-blooming bulbs, then acquire the bulbs (or rhizomes) of your preference at local garden centers, mail order nurseries, or the local sale of iris rhizomes. At a recent talk by a skillful gardener, I learned new techniques for repotting plants in containers. First, let’s review the usual approach to this routine process. When a plant has outgrown its container, the goal for repotting is to encourage and support the plant’s further growth. The signs that a plant has outgrown its containers include roots growing out of the drainage hole, or roots filling the container (observed after lifting the pant from its container), or an abundance of multiple shoots or offsets. Additional signs of a pot-bound plan: a plastic nursery pot might bulge with the plant’s roots, or the soil in the container dries out quickly. When the gardener observes the beginnings of such signs, it is time to remove the plant from its container and replant it in a larger container with fresh potting soil and irrigate to settle the soil around the roots. The common wisdom is to move the plant into the next larger container, e.g., from a one-gallon pot to a one-and-one-half gallon pot. When a plant becomes significantly root-bound, however, good practice calls for root pruning. If roots have been circling the pot, cut through the roots with a hand pruner, and in some cases, peel away the outer layer of roots. If the roots are packed tightly in the pot, loosen the roots, cut away up to one-third of the roots, and make vertical cuts about one-third of the way up from the bottom of the root ball. These actions will stimulate the growth of new roots. When reducing the root ball in this way, it could be appropriate to replant the plant in the same pot it had outgrown. This might be desirable when the gardener favors the container, or the container complements the plant nicely. During this process, cut back a proportionate amount of the top growth to reduce the plant’s demand on its reduced root structure. In a short time, the plant will recover from repotting and resume vigorous growth. Briefly, these are the usual steps to take to rescue a root bound plant and help to continue growing. Then, Keith Taylor’s eye-opening talk and demonstration for the Monterey Bay Area Cactus & Succulent Society introduced different goals and techniques for repotting plants. Taylor has been growing cacti and succulents for about twenty-seven years, with a previous background in bonsai cultivation. He has developed bonsai-related techniques for cultivating succulents, with an emphasis on caudiciform plants. Those are plants that develop a swollen trunk, stem or root—called a caudex—that stores moisture. These unusual plants are candidates for bonsai treatment and often favored by collectors. Instead of repotting plants to encourage and accommodate growth, Taylor seeks to limit their size, promote larger and wider caudices, and stimulate compact top growth. In pursuit of these goals, Taylor’s distinctive approach to repotting includes severe pruning of the plant’s roots and top growth. Without hesitation, he would cut off a plant’s taproot and close to all its fibrous roots to reduce the root ball to fit into a shallow bonsai pot. With some caudiciforms, he would cut the caudex literally in half, and wait for it to develop new roots. Top growth pruning was equally extensive with the same objective of constraining the plant’s overall growth. The roomful of avid gardeners of cacti and succulents understood Taylor’s bonsai pruning method, although this approach to gardening was unfamiliar them. These gardeners were familiar with limiting the size of their plants by keeping them in small containers with lean soil mixes and minimal moisture. At the same time, many were astonished by Taylor’s relatively extreme pruning practices, which freely exceed the usual guideline to remove no more than one-third of a plant’s roots or top growth. While Taylor admitted that some of his early trials of such pruning were unsuccessful, he has found that many plants tolerate this treatment and respond well in time. The gardeners in attendance learned that the one-third rule for pruning could be overly conservative and that more severe pruning could be effective in limiting plant growth. Bonsai-style pruning of cacti and succulents remains as a specialized form of container gardening and not everyone’s preference we learned that extreme pruning does not necessarily kill a plant. Taylor’s distinctive pruning practices are closely related to his work in creating containers for plants. Examples of his extraordinary ceramic pots can be viewed on his website, and his Facebook page, where he is known as “Kitoi” (his childhood nickname). Even when we know basic gardening methods, new knowledge is always ready for discovery. A photo of a new iris caught my eye. I learned it is the recent accomplishment of a local iris hybridizer, Jim Cummins, who is a stalwart of the Monterey Bay Iris Society and long-time friend. The iris is so new it doesn’t even have a name; it’s referred to only as “Seedling 14-21-C, TB”, indicating that it is a Tall Bearded Iris. The numbers suggest that this is one of a large number of seedlings. Hybridizing irises involves a process that is essentially the same in hybridizing other plants. First, the hybridizer selects two plants that have desirable characteristics that would be good to combine in one plant. Characteristics might relate to flower form, height, plant vigor, color, beards, ruffles, or ability to re-bloom, i.e., produce a second flush of bloom. The hybridizer then transfers pollen from the three anthers of one plant, the pollen parent, to the three stigmas of the other plant, the pod parent. These can be called the ”father” and “mother” plants if preferred. Some hybridizers will transfer pollen with a cotton swab, paintbrush, pencil or knife; others will use tweezers to actually remove the anther and bring it to the stigma. This simple process can be seen on YouTube demonstrations. Detailed record keeping is important so that the parents of an exceptional new plant will be known. Then, assuming fertilization is successful, the pod parent produces a seedpod. When it matures, the hybridizer harvests and plants the seeds, and waits to see what results. Even a little familiarity with genetics suggests that this process is chancy. The progeny might be exactly what the hybridizer intended, or any of a wide range of other outcomes that are more or less successful. The hybridizer might propagate the best results, register a name with the American Iris Society, and introduce the plant into the commercial market. The Cummins seedling 14-21-C, TB has noteworthy parents, ’Luxuriant Lothario’ and ‘That’s All Folks’. In 2005, William Maryott registered ‘That’s All Folks’, his last introduction before retiring. This plant has been described as follows: “Midseason bloom. Standards brilliant gold; falls white with gold blending to a wide muted gold band; beards gold. Honorable Mention 2007; Award of Merit 2009; Wister Medal 2011; American Dykes Medal 2013.” Local hybridizer Joe Ghio reportedly bred this plant and registered a sibling named ‘Pure and Simple’ in 2005. ‘That’s All Folks’ is a favorite of mine; I am developing a swath of its brilliantly colored blossoms, and planning a companion planting of an appropriate blossom color. A large group of gardeners is hybridizing irises, and gorgeous cultivars by the thousands are available. A fine time to see some of the newest and best is at the annual Iris Show presented by the Monterey Bay Iris Society. This year’s Show will be at the Louden Nelson Community Center, 301 Center Street, Santa Cruz, on April 28th and 29th. The public is invited to attend the show from 1:00 –6:00 p.m. on Saturday, and from 10:00 – 5:00 on Sunday. The Show offers an ideal occasion to see some of the finest flowers grown by local gardeners, and to make notes on plants to add to your own garden. Opportunities to purchase your favored plants will be at the Society’s annual sale of iris rhizomes on August 4th at August 4 at Deer Park Shopping Center in Aptos and on August 11 at the Cabrillo Farmers Market. Choose your favorite irises now, shop in August, and plant in September. After happening upon a month-by-month checklist for growing cannabis, beginning about now, my curiosity took over and I searched for seeds for my first legal marijuana grow. This column is intended for gardeners who have interest in personal (non-commercial) cultivation of marijuana, and lack experience in this area. Seeds are easy to find on the Internet: just search for “marijuana seeds.” They are more expensive than the seeds of familiar garden plants because they are still new on the gardening scene. Weed seeds are all too easy to come by, but several cannabis cultivars have been brought to the market, each with a combination of desired characteristics, so the marketplace is thriving. While exploring the options, the basics of seed selection and marijuana cultivation gradually came into focus. An important option relates to the fact that cannabis is normally dioecious, meaning that it produces separate male and female plants. Occasionally, however, some plants can be monoecious, having male and female flowers on the same plant. Unfertilized female flowers produce the best buds, so some growers will either grow only female plants or identify and remove male flowers before they can produce pollen. With a little care, one could pollinate female flowers selectively to produce seeds for a subsequent generation of plants. Cannabis breeders have developed “feminized” plants, i.e., without male chromosomes, which are available as an easy option for growing buds of desirable quality. These plants can only produce unfertilized female flowers. A gardener could either propagate cuttings from a feminized plant to produce another generation of plants or buy seeds of the same or different cultivar, choosing from wide and growing range of possibilities. Another important option in seed selection involves the recently modified growth cycle. Natural (“wild”) marijuana plants are photosensitive and dependent on the onset of longer nights to trigger the development of the desired buds. Growers have had to simulate this transition from the vegetative stage to the flowering stage by providing high light levels during the vegetative stage followed by periods of darkness to prompt the flowering stage. Cannabis breeders have made this process easier by developing “auto-flowering” plants that progress to the flowering stage after the passage of a certain amount of time, rather than in response to light changes. Auto-flowering plants still grow during their vegetative stage best under high light levels, but such plants can be grown at any time of the year and without burdensome manipulations of light and darkness. A third option concerns the mature size of the plant. Using wild plants again as our reference, the most popular species, Cannabis sativa, when grown outdoors without controls can reach or even exceed twelve feet in height. California law limits personal cultivation of marijuana to indoor sites, e.g., a greenhouse, where plants are less likely to grow to an unmanageable size and be trained to be smaller, bushier and more productive of buds. Still, breeders have developed so-called compact plants that will remain under four feet tall at maturity. There are additional variables to consider in seed selection: the plant’s relative strength of psychoactive THC versus medicinal CBD; a given strain’s balance of C. indica and C. sativa; and the character of the plants’ effect on a user, which the individual user surely would moderate. The curious gardener might wish to explore this horticultural byway. Those that do should comply with state law and local regulations regarding personal cultivation of marijuana.The Cannifornian website is a great source of information on regulations in California’s cities and counties. Dahlias are among the easier blossoming plants to cultivate in the garden. As natives of Mexico, they thrive in the Monterey Bay area climate and bring drought-tolerance as well. As mentioned in today’s article about the upcoming sale of the Monterey Bay Dahlia Society, dahlias are available in many different blossom forms and colors and can be a fine addition to the garden. This column offers basic practices for growing dahlias after you have selected tubers at the Society’s sale. The first consideration is to select a location will full exposure to the sun and good drainage. Dahlias, like most flowering plants, grow best with six hours of sun each day, and in well-drained soil. Sandy loam is fine, but clay soil will require substantial amendment with organic material. Dahlias can be planted any time between the last day of frost (which is not a concern in this area) and as late as mid-June. The local tuber sale is scheduled around the time when last season’s tubers are ready to be dug and divided, so the day of the sale represents a good beginning for the local planting season. If you are not ready to plant, store your new tubers temporarily in a cool, shady environment. Most dahlias will need staking, so it’s a good practice to position a sturdy stake for each tuber, and to install the stake at the same time that you plant the tune. Inserting a stake later runs the risk of stabbing the tuber. If you don’t want bare stakes in the garden while the plant develops, you could install a short piece of plastic pipe with the top at ground level next to the tuber, then, when the plant grows to need staking, insert a thin stake (bamboo?) in the plastic pipe and tie the plant to the stake. Plant the tuber several inches deep, with the “eye” (the growing point) facing up. Some tubers might lack such an eye, and will not sprout, but well-selected tubers will have viable growing points. The eye can be difficult to confirm, so selection can require some experience in identifying tubers that are ready to grow. Separate the tubers from each other by about two feet. Protect the sprouting plants from snails and slugs. A good practice is to visit your plants in the night (with a flashlight) or in the early morning to remove any crawling pests that have discovered them. Regular applications of an organic snail control, e.g., Sluggo, also works. Control flying pests with insecticidal soap or other organic pesticides. Generally, soil with ample organic content will provide sufficient nutrients for dahlias. If your soil seems “lean,” regular applications of high-nitrogen, organic fertilizer would be helpful. As each plant grows, tie it to a stake to ensure that it remains upright. The first tie should hold the main stalk loosely to the stake; later ties could connect branches to the stake. Each branch generally will produce three buds. To produce large blossoms, many gardeners remove two of these buds when they appear. This disbudding process allows the plant to direct nutrients to the remaining bud, with positive effect. If you have several dahlias growing in the garden, you will still have lots o blooms. At the end of the season, the top growth dies back, and the plant produces several new tubers. The gardener can remove the top growth, and can either dig and replant the tubers or leave them in the ground. In the Monterey Bay area’s moderate climate, dahlias grow quite well when simply left in the ground. After two or three years, they will become crowded and will benefit from dividing. Enjoy your dahlias! They are wonderful additions to the garden. removal of a long-standing ban on growing cannabis for personal recreational use by adults. Voters approved Proposition 64, which legalizes “growing up to six marijuana plants and keeping the marijuana produced by the plants within a private home.” This column provides a brief introduction to the cultivation of marijuana; interested gardeners should read all of the proposition’s provisions related to personal uses of marijuana. Cannabis (Marijuana), a herb with psychoactive properties, is a genus of the Cannabaceae family. Other genera in this family include Celtis (Hackberry), Humulus (Hop) and about eight other less familiar plants. There are three species of Cannabis: C. sativa, C. indica, and C. ruderalis. There are many C. sativa x indica hybrids that combine sativa’s productivity and indica’s more compact size. The plant grew originally in mountainous regions northwest of the Himalayas, and is now indigenous to central Asia and India; it grows well in much of California. Cannabis is dioecious, meaning the genus has separate female and male plants. Only about 6% of flowering plants are dioecious; the great majority is monoecious, having both male and female flowers. The flowers of well-grown female plants (called sensimilla, meaning “without seeds”) of both C. sativa and C. indica secrete an abundance of chemical compounds (cannabinoids), mostly tetrahydrocannabinol (THC), a psychoactive constituent, and cannabidiol (CBD), which has a range of medical applications. For an accessible version of the cannabidiol article, visit this site. Related articles: Tips on cannabis web design. Growing cannabis for personal use would be well within the skills of typical gardeners: the plant grows so vigorously that it is commonly called “weed.” The reasons for growing your own marijuana include controlling expenses, avoiding synthetic chemicals, and selecting preferred cultivars (“strains”). Growing the plant for optimal production of THC involves some care, so the challenge to succeed could be satisfying in itself. Local garden centers are unlikely to offer Cannabis seeds or seedlings in the near future. Two local garden center managers told me they would stay out of the Cannabis market at least until federal laws allow personal, recreational use of the plant. For this reason, the best way to begin is to buy seeds online. A search of the Internet for “Cannabis seeds” will yield links to several vendors offering various strains, each with features of potency, productivity, fragrance, taste, disease resistance, etc. Generally, seeds are offered online in small packets, with prices ranging around $5 to $10 per seed. Growers claim germination rates of 90-95%, so two or more gardeners might share the cost of a seed purchase. Sprouting Stage. Germinate seeds in the spring by placing them in a damp paper towel. The seeds should show a small white taproot within 72 hours. Plant the seeds ¼-inch deep in planting mix with the root pointing down in a small biodegradable container, e.g., a peat pot. Keep the soil slightly damp with de-chlorinated water (leave tap water in an open container for 24 hours to release chlorine gas). Leave for 1 to 3 weeks. Vegetative Growth Stage. Move the small plant (still in its biodegradable container) to a 3-to-5 gallon pot filled with planting mix plus compost. The mix should be kept slightly damp with slightly acidic (low pH) water, and the plant should receive maximum sunlight. If growing indoors, maintain 72–85°F, and provide a high level of light for 18–24 hours/day. Feed the plant with high-nitrogen fertilizer. During this stage, prune off about ¾ of the top growth tip to promote new top growth and additional buds. This is also the right stage to take cuttings for the propagation of clones. Flowering Stage. Once the plant grows to18 inches or more in height, it will be ready for flowering. To stimulate flowering, provide strong light for 12 hours/day, and complete darkness for 12 hours/day. If the plants have been growing outdoors, this could require moving the plants indoors for the dark period each day. During this stage, the plants could double in size. Harvesting Stage. Reaching this stage could take 5 weeks, during which the plant benefits from phosphorus (e.g., chicken or bat compost tea) more than nitrogen. As the buds develop, they will emit resinous trichomes that will change from clear to cloudy to amber in color. Using a low-power magnifier, watch for when about 50% of the trichomes become amber, indicating that the buds are ready for harvest. Cut each of the bud masses, keeping them large and intact. Drying and Curing Stage. Air-drying is simplest and most popular. Suspend the bud cuttings upside down in a room with moving air for about seven days. Then, place them in airtight glass jars for at least 2 weeks. Longer is better. To release moisture, open the jars daily to during the 1st week, and every other day during the 2nd The marijuana should then be ready to smoke. There is much to learn. Several “how-to” articles and short books are freely available online, revealing perhaps what generous marijuana cultivators do while their plants grow. To find and download these resources, search the Internet for “how to grow marijuana,” or visit selected websites listred below. Growing your own marijuana is like making your own wine: it’s possible but not for every gardener. Let us know of your experience! I Love Growing Marijuana — An experienced cultivator of marijuana, Robert Bergman, maintains this website which offers many free or low-cost resources for cultivating Cannabis. The site also offers a variety of Cannabis seeds, with brief descriptions of their properties. Seed Supreme — Another source of Cannabis seeds. As we continue to learn about gardening, we are often reminded of nature’s essential role in the process, and, by extension, the wisdom demonstrated by historical gardeners as they worked in concert with nature. We have countless examples of the benefits of “gardening with nature,” and ample evidence of the short-sightedness of technology-based agribusiness. ”Technology” as used here encompasses monocropping, animal feedlots and synthetic fertilizers and pesticides, as well as more constructive activities such as the use of drone aircraft to monitor crops. Should watch out drone jammers, though. One fascinating historical instance of natural gardening is biochar. The briefest definition of biochar is organic matter that has been heated to high temperatures with limited oxygen to produce charcoal. This process (pyrolysis) also produces gasses that can be burned to produce electricity. Biochar is very similar to charcoal, which is made principally from wood, and used in backyard barbecues and a variety of industrial processes. 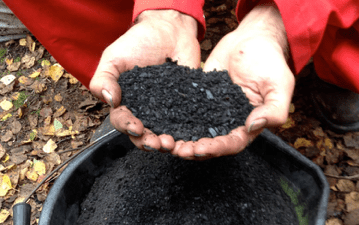 Biochar, by contrast, is made from all kinds of organic waste, particularly garden or agricultural waste, and is used as a soil amendment, adding carbon to the soil. Note: The biochar photo is from a good article by Jeff Cox in Rodale’s Organic Life. Biochar apparently has been produced and used for thousands of years by early gardeners in Brazil’s Amazon River Basin to improve their rather poor soils. In 1870, an American geologist and explorer discovered and reported areas of dark and highly fertile soil. Researchers puzzled over the origin of this unusual soil, called “terra preta” but recognized that it has strong benefits for agriculture. During the past twenty years or so, scientists have attributed several valuable properties to biochar, beyond improving crop yields. The additional benefits include increasing water-holding capacity of soil, reducing the need for chemical fertilizers, reducing natural emissions of greenhouse gasses (nitrous oxide and methane) from agricultural soils, increasing soil microbial life, resulting in carbon sequestration, avoiding the natural decomposition of agricultural and forestry waste and thereby decreasing carbon dioxide emissions. This success story has only an outside chance because it assumes universal participation by the world’s farmers, but does reflect the genuine value of biochar. Still, individual gardeners could help to reverse global warming by using biochar. This material is available commercially, but it’s costly. A quick survey of sources on the Internet shows a typical price around $30 per cubic foot, enough to amend a garden bed of twenty-four square feet. For more on this topic, visit the International Biochar Initiative. Biochar could increase dramatically the fertility of your soil, and help you to rival the successes of ancient gardeners of the Amazon Basin. A reader’s query and my reply. Q: I read your article in Friday’s Sentinel about biochar. I am wondering if I can put used, regular, charcoal from the grill in the garden. There is always some left over. Can I break it up and put it in my garden? It seems like I read somewhere years ago I could, but I can’t remember. A: By “used charcoal” do you mean ashes? I have attached a short article that is about Colorado’s soil, but California soil also tends to be alkaline, so the article has relevance in our area as well. The bottom line is that charcoal ash, which is alkaline, would have some value when added to very acidic soil, i.e., low pH, but doesn’t add any fertility to the soil. On the other hand, unburned, or partially burned charcoal briquettes (made from wood) could be useful as a soil amendment, although they have less nutrient value than biochar, which is made from a range of vegetative materials. Charcoal briquettes usually contain cornstarch as a binder, and might include coal, lime and other ingredients, none of which would be harmful in the garden. Soften them in water to break them down, then dry the result to mix into fertilizers or directly into the soil. Fine article, though it sort of glosses over the fact that biochar itself is 99% carbon that stays in the soil for hundreds if not thousands of years. While compost only costs $3 or more per cubic foot (depending on quality, volume you buy and packaging/marketing variables) it needs to be replaced every year, forever, to result in similar levels of carbon sequestration and fertility. Of course the best is to add biochar, once to satisfactory levels, and then amend with compost for the nutrients and energy feeding the soil life, every year. In this approach you would use less compost to get the same or better results and your carbon sequestration would be more or less permanent! The growing community of organic gardeners—which hopefully includes you—represents the “good guys” in several current struggles between public and private interests in gardening and commercial agriculture. Gardeners and farmers are quite different in many respects, but both are engaged in growing plants. Mother Nature also grows plants, and has been doing so successfully since the dawn of time. For about 10,000 years, gardeners and farmers have cooperated with Mother Nature to grow and harvest plants to eat, treat illnesses, dye fabrics, and enjoy their beauty and fragrance. They gradually developed ways to increase yields, reduce the work of growing and improve the qualities of their plants. For the most part, these changes have been compatible with natural processes. Eventually, people adopted various technologies to improve gardening and especially farming. Beginning 4,500 years ago, various inorganic materials and organic substances derived from natural sources were used as pesticides. Major agricultural technologies include the mechanical reaper (1831) by Cyrus McCormick, and the tractor (1868), both of which brought new efficiencies. In the 1940s, agribusiness began using synthetic chemical pesticides and great quantities of synthetic nitrogen fertilizer. In both cases, there was little or no knowledge of the impacts of these chemicals on human health or the environment. Rachel Carson’s book, Silent Spring (1962) raised awareness of the conflict between public and private interests related to agrichemicals. In the 1970’s, research began to development Integrated Pest Management (IPM) strategies, which rely upon natural processes and do not use synthetic chemicals. IPM became widely used beginning in the late 1970s. During more recent decades, continuing research and development produced more selective products, including glyphosate, which soon became most widely used herbicide, worldwide. The ancient methods of organic gardening continued throughout this history, but the seeming cost-effectiveness of uses of agrichemicals dominated commercial agriculture. Today, we are discovering the consequences of attempts to fool Mother Nature. Insects are developing resistance to synthetic insecticides, weeds are developing resistance to synthetic herbicides, and we are discovering that at least some of these materials threaten our health. The State of California already has listed 800 chemicals known to cause cancer or birth defects or other reproductive harm, and early this month issued a notice of intent to classify glyphosate as a carcinogen.This classification is based on the findings of the World Health Organization. See: CSG Prop 65 Heirloom EXPO FLYER Glyphosate 9-7-15. In addition, speakers at recent conferences have called for uses of regenerative agriculture, which is a form of organic farming designed to build soil health or regenerate unhealthy soils. This practice could counteract “conventional” agriculture’s destructive practices, which include uses of synthetic chemicals. Many of those chemicals weaken or kill the soil microbiota, and thereby disrupt the natural carbon cycle and contribute substantially to global warming. By any measure, we are now in a historic period of change, to reject shortsighted agricultural technology and return to more natural processes. Our health and the health of the environment depend on the success of this transition. Climate change has been described as the consequence of the Industrial Revolution, which introduced extensive burning of fossil fuels. This practice disrupts the natural balance of carbon in the soil, the atmosphere and the ocean. Plans to slow or reduce the process of climate often emphasize reducing uses of fossil fuels. Recently, and all too briefly, we explored the relationship between gardening and climate change. We have learned that common agricultural practices generate about one-third of the surplus CO2 in the atmosphere, making commercial farming a substantial part of the climate change problem. Prior to the development of modern agriculture, we had organic farming, which is generally compatible with natural processes. The practices we now call “conventional” farming include driving a tractor, tilling the soil, over-grazing, and using fossil fuel-based fertilizers, pesticides and herbicides. Similarly, farm animals once were raised in pastures, where they grazed on grasses and other plants. Today, cows, pigs and chickens are raised in tight quarters, provided grains and other feed that they work hard to digest, and must be dosed with antibiotics to maintain basic health. These contemporary, presumably efficient methods are depleting the carbon stores in the soil, and reducing the soil’s natural ability to support plant growth and store moisture. Soil scientists and environmentalists have been discovering land management strategies that can reduce the rate of loss of soil carbon, and even improve the rate at which agriculture can convert atmospheric CO2 into plant material and soil organic matter. When thoughtfully applied, carbon methods can add significantly to the rate of soil carbon sequestration, and actually reverse the climate change process. Dozens of specific practices are included in carbon farming; all look like historical organic farming and common sense. The principal methods are composting, grazing by hoofed animals (ungulates), maintaining high percentages of organic matter in the soil (to feed the microbiota), supporting biodiversity, rotating crops and discontinuing uses of synthetic chemicals. The most effective practices orchestrate multiple methods in plans designed for specific circumstances. Carbon farming, also called regenerative agriculture, should be part of the global response to the threat of climate change, but reduced burning of fossil fuels will still be important. These promising methods for the management of agricultural lands can have substantial impacts when applied on a large scale, but they also have value when applied in residential gardens. In this column, we have advocated organic methods as beneficial to our flora and fauna. We find now that these methods also have long-term benefits to the health of the soil and the natural balance of carbon in our environment. If you are growing plants and raising animals on hundreds of acres, try carbon farming. If not, by all means, garden organically!